Ethiopian Airlines flight ET302 crashes shortly after take-off from Addis Ababa, killing all on board. Ethiopian airlines flight ET302 to Kenya's capital, nairobi crashes shortly after take off, killing all passengers and crew on board. The Ethiopian Airlines' Boeing 737 MAX 8, bound for Nairobi, Kenya's capital from Ethiopia's capital Addis Ababa crashed minutes after takeoff. Departure was at 8:38am local time, and the aircraft came down in the town of Bishoftu, approximately 39 miles south-east of the Ethiopian capital. The aircraft, with the registration ET-AVJ, is believed to be the same model as the Indonesian carrier aircraft which crashed in October 2018, killing the 189 people on board. No one on board survived, with the majority of passengers being Ethiopian nationals. However, 32 Kenyans, 18 Canadians, 8 Americans and 7 British nationals were believed to be on board. A total of 157 passengers, including 8 crew members, did not survive. 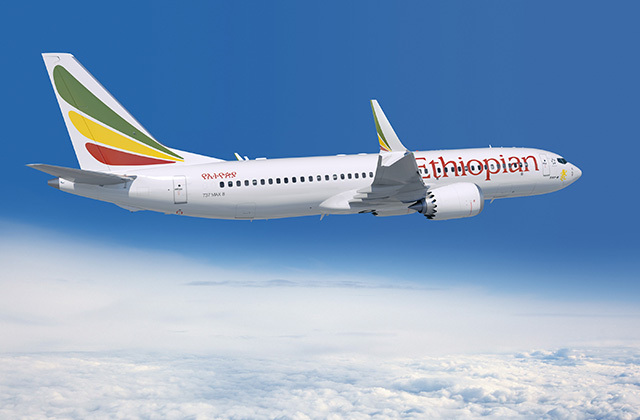 The aircraft, ET-AVJ was delivered to Ethiopian Airlines in November 2018, and had its first commercial service on the 17th November 2018 from Addis Ababa to Dubai. This is the 2nd Boeing 737 MAX 8 to be involved in a fatal accident. With over 5,000 orders sent in, and 350 deliveries of the aircraft model so far, it has become a favourite among many worldwide airlines including its primary users, Southwest Airlines, American Airlines, Air Canada and Norwegian Air Shuttle. Ethiopian Airlines claims that the flight crew of Flight ET302 lost contact at 8:44am local time. A press conference with the CEO of the airline stated that the pilot reported difficulties with the aircraft to ATC (Air Traffic Control). The pilot was given clearance to return to Bole Airport in Addis Ababa. It is reported that at the time of the accident, weather was good, with a visibility of 10+ kilometres and few clouds at 2,500 feet. Ethiopian Airlines stated that the pilot was a Senior Captain named Yared Getachew, who had more than 8,000 flight hours. He was assisted by First Officer Ahmed Nur Mohammod Nur, who had 200 flight hours. 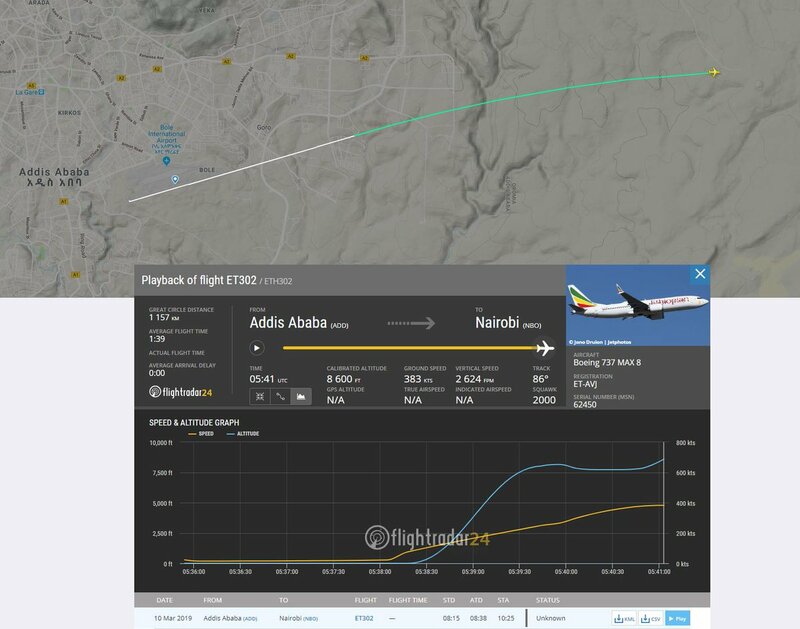 Aircraft Tracking service Flightradar24 reported that due to limited coverage of the area in question, they were able to track the Ethiopian Airlines flight for 3 minutes after take off. Reports from the ADS-B network show that they vertical speed of the aircraft was unstable after take off. On Monday 11th March, the Ethiopian Airlines Flight ET302's black boxes were recovered. - Investigations have commenced into the black boxes to recover voice and data from the flight. On Tuesday 12th March, it has been reported that the Boeing 737 MAX 8 has been grounded and banned in many countries. China, Indonesia, Britain, Australia, Singapore, Malaysia and Oman have banned the aircraft from their airspaces. - The United States continues to use the aircraft, with Southwest Airlines and American Airlines still operating the aircraft. 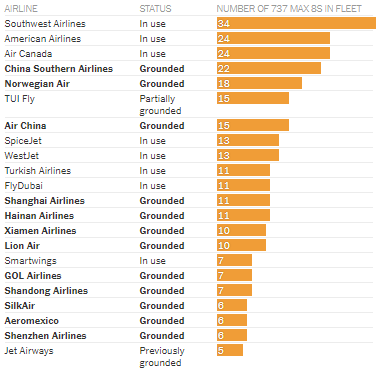 16 other carriers around the world are also flying the jet. 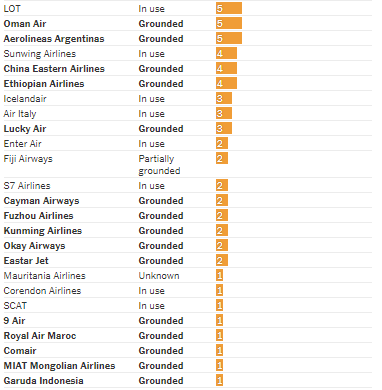 27 airlines, and more as time goes on have grounded the aircraft. - Boeing states that the aircraft is of a good quality and safety, however Chief Executive Dennis Muilenburg cautioned against speculating about "the cause of the accident without all the necessary facts," adding that it could "compromise the integrity of the investigation." With the ban of the use of Boeing 737 MAX 8 in Britain, it has affected multiple airlines, including TUI Group, which operate package holidays, and Norwegian Airlines, which has a 18 MAX 8's within its fleet, which have stopped operating. - Both airlines have assured passengers that there will be delays and cancellations of many flights they fly. With technical software issues thought to be the risk, Boeing has assured airlines and passengers that fixes will be issued. While the investigation continues, we send our hopes to the families of the lost.